Teachers regularly pose questions to their students, but the purpose and form of these questions can vary widely. This book is about a particular kind of question—one we call "essential." So, what makes a question "essential"? Let us begin by engaging you in a bit of inquiry using the following concept-attainment exercise to examine the characteristics of an essential question. The exercise has three parts, as explained in the next several paragraphs. First, examine the questions in the two columns and try to determine the distinguishing characteristics of the ones labeled "Essential" compared to those labeled "Not Essential." What traits do the essential questions have in common? How do they differ from the others? • How do the arts shape, as well as reflect, a culture? • What common artistic symbols were used by the Incas and the Mayans? • What do effective problem solvers do when they get stuck? • What steps did you follow to get your answer? • How strong is the scientific evidence? • What is a variable in scientific investigations? • Is there ever a "just" war? • What key event sparked World War I? • How can I sound more like a native speaker? • What are common Spanish colloquialisms? • Who is a true friend? • Who is Maggie's best friend in the story? Second, look at these additional examples, organized by subject area, to spark your thinking and clarify the qualities of essential questions, or EQs. • Whose "story" is this? • How can we know what really happened in the past? • How should governments balance the rights of individuals with the common good? • Should _______ (e.g., immigration, media expression) be restricted or regulated? When? Who decides? • Why do people move? • What is worth fighting for? • When and why should we estimate? • Is there a pattern? • How does what we measure influence how we measure? How does how we measure influence what we measure (or don't measure)? • What do good problem solvers do, especially when they get stuck? • How accurate (precise) does this solution need to be? • What are the limits of this math model and of mathematical modeling in general? • What do good readers do, especially when they don't comprehend a text? • How does what I am reading influence how I should read it? • Why am I writing? For whom? • How do effective writers hook and hold their readers? • What is the relationship between fiction and truth? • How are stories from other places and times about me? • What makes objects move the way they do? • How are structure and function related in living things? • Is aging a disease? • Why and how do scientific theories change? • How can we best measure what we cannot directly see? • How do we decide what to believe about a scientific claim? • What can artworks tell us about a culture or society? • What influences creative expression? • To what extent do artists have a responsibility to their audiences? • Do audiences have any responsibility to artists? • What's the difference between a thoughtful and a thoughtless critique? • If practice makes perfect, what makes perfect practice? • What should I do in my head when trying to learn a language? • How can I express myself when I don't know all the words (of a target language)? • What am I afraid of in hesitating to speak this language? How can I overcome my hesitancy? • How do native speakers differ, if at all, from fluent foreigners? How can I sound more like a native speaker? • How much cultural understanding is required to become competent in using a language? • How can I explore and describe cultures without stereotyping them? How does your working definition compare? Questions that meet all or most of these criteria qualify as essential. These are questions that are not answerable with finality in a single lesson or a brief sentence—and that's the point. Their aim is to stimulate thought, to provoke inquiry, and to spark more questions, including thoughtful student questions, not just pat answers. They are provocative and generative. By tackling such questions, learners are engaged in uncovering the depth and richness of a topic that might otherwise be obscured by simply covering it. Now we present the third part of the concept-attainment exercise. Using the characteristics we presented and those that you noted, which of the following questions do you think are essential? Why? 1. In what year was the Battle of Hastings fought? 2. How do effective writers hook and hold their readers? 4. Onomatopoeia—what's up with that? 5. What are examples of animals adapting to their environment? 6. What are the limits of arithmetic? Check your answers against the key on page 15. How did you do? Are you getting a better feel for what makes a question essential? Good! Now we'll probe more deeply to uncover the nuances of EQs. Although we have characterized essential questions as being important for stimulating student thinking and inquiry, this is not their sole function. In the body of work known as Understanding by Design (McTighe & Wiggins, 2004; Wiggins & McTighe, 2005, 2007, 2011, 2012), we propose that education should strive to develop and deepen students' understanding of important ideas and processes so that they can transfer their learning within and outside school. Accordingly, we recommend that content (related goals) be unpacked to identify long-term transfer goals and desired understandings. Part of this unpacking involves the development of associated essential questions. In other words, EQs can be used to effectively frame our key learning goals. For example, if a content standard calls for students to learn about the three branches of government, then questions such as "When does a government overstep its authority?" or "How might we guard against governmental abuses of power?" help stimulate student thinking about why we need checks and balances, what the framers of the Constitution were trying to achieve, and other governmental approaches to balancing power. Note that the question has more than one answer, even if in the United States we have grown accustomed to our particular answer. In this sense, the question is still open, not closed. We'll have more to say about how to come up with good essential questions in later chapters, but for now try this simple thought experiment. If the content you are expected to teach represents "answers," then what questions were being asked by the people who came up with those answers? This conceptual move offers a useful strategy both for seeing a link between content standards and important questions and for coming up with ways of engaging students in the very kind of thinking that is required to truly understand the content. In short, expert knowledge is the result of inquiry, argument, and difference of opinion; the best questions point to hard-won big ideas that we want learners to come to understand. 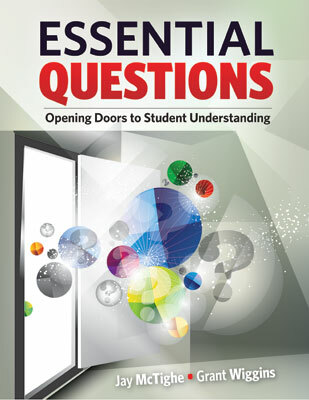 The questions thus serve as doorways or lenses through which learners can better see and explore the key concepts, themes, theories, issues, and problems that reside within the content. It is also through the process of actively "interrogating" the content using provocative questions that students strengthen and deepen their understanding. For instance, a regular consideration of the question "How are stories from different places and times about me?" can lead students to the big ideas that great literature explores—the universal themes of the human condition underneath the more obvious peculiarities of personality or culture—and thus can help us gain insight into our own experiences. Similarly, the question "To what extent can people accurately predict the future?" serves as a launch pad for examining big ideas in statistics and science, such as sampling variables, predictive validity, degrees of confidence, and correlation versus causality. • The geography, climate, and natural resources of a region influence the economy and lifestyle of the people living there. • How does where you live influence how you live? • Statistical analysis and data display often reveal patterns. Patterns enable prediction. • What will happen next? How sure are you? • People have different dietary needs based on age, activity level, weight, and various health considerations. • How can a diet that is "healthy" for one person be unhealthy for another? • Dance is a language of shape, space, timing, and energy that can communicate ideas and feelings. • How can motion express emotion? A finer-grained examination of such questions reveals three different but overlapping meanings for the term essential. One meaning of essential includes the terms "important" and "timeless." Essential questions in this sense arise naturally and recur throughout one's life. Such questions are broad in scope and universal by nature. What is justice? Is art a matter of taste or principles? How much should we tamper with our own biology and chemistry? Is science compatible with religion? Is an author's view privileged in determining the meaning of a text? Essential questions of this type are common and perpetually arguable. We may arrive at or be helped to grasp understandings for these questions, but we soon learn that answers to them are provisional or more varied than we might have imagined. In other words, we are liable to change our minds in response to reflection, different views, and rich experience concerning such questions as we go through life—and such changes of mind are not only expected but beneficial. A good education is grounded in such lifelong questions, even if we sometimes lose sight of them while focusing on content mastery. Such questions signal that education is not just about learning "the answer" but also about learning how to think, question, and continually learn. A second connotation for essential refers to "elemental" or "foundational." Essential questions in this sense reflect the key inquiries within a discipline. Such questions point to the big ideas of a subject and to the frontiers of technical knowledge. They are historically important and very much alive in the field. The question "Is any history capable of escaping the social and personal history of its writers?" has been widely and heatedly debated among scholars over the past hundred years, and it compels novices and experts alike to ponder potential bias in any historical narrative. Questions such as "How many dimensions are there in space-time?" and "To what extent are current global weather patterns typical or unusual?" are at the forefront of debate about string theory in physics and global climate change in climatology, respectively. The question "Is it more a sign of creativity or arrogance when a writer tries to tell a story from the perspective of a gender or culture different from his or her own?" has been energetically debated in the world of literature and the arts in recent years. You may have heard that so-called higher-order questions should begin with the stems why, how, or in what ways. Indeed, such question starters seem to signal inherently open-ended thought, inviting multiple responses. Do not assume, however, that all questions beginning with what, who, or when are necessarily asking for factual answers or that why questions are inherently higher-order. For example, consider these questions: What is fair in economics? Who is a "winner"? When should we fight? These are clearly not recall questions. They encourage thinking and discussion, and one's answers may evolve over time. Alternately, you could ask your class, "Why did World War II start?" but really be seeking the single answer that is provided in the textbook. This consideration leads to a more general point: intent trumps form. Why you ask a question (in terms of the desired result of asking it) matters more than how you phrase it. No question is inherently essential or trivial. Whether it is essential depends on purpose, audience, context, and impact. What do you as a teacher intend for students to do with the question? Recall the earlier example "Is biology destiny?" It is framed in a way that to the uninitiated might sound closed or factual. But clearly we would ask it to spark interesting and pointed debate about what is and isn't predictable about human behavior and health. In other words, the essentialness of the question depends upon why we pose it, how we intend students to tackle it, and what we expect for the associated learning activities and assessments. Do we envision an open, in-depth exploration, including debate, of complex issues, or do we plan to simply lead the students to a prescribed answer? Do we hope that our questions will spark students to raise their own questions about a text, or do we expect a conventional interpretation? In other words, if we look only at the wording of a question out of context, we cannot tell whether the question is or is not essential. Consider the question "What is a story?" Clearly, if we pose this question with the intent of having students give a textbook answer ("a story contains a plot, characters, setting, and action"), then the question (as pursued) is not essential in terms of our criteria. However, if the question is being asked to initially elicit well-known story elements but then overturn that conventional definition through a study of postmodern novels that lack one or more of these elements, then it functions in an "essential" manner. A 2nd grade teacher asks, "Boys and girls, look at the numbers 2, 4, 6, 8, ___. What comes next? What's the pattern?" In this case, the question is leading toward a specific answer (10). An Algebra 1 teacher presents students with a set of data and asks them to plot two related variables on a graph. "What do you notice? What's the pattern?" In this case, the teacher is guiding the students to see a linear relationship in all the data. A science teacher shows a data table of incidents of AIDS cases over a 15-year period, disaggregated by age, gender, region, and socioeconomic status. His question to students is "What's the pattern (or patterns)?" Instead of a pat answer, he intends to evoke careful analysis, reasoning, and spirited discussion. • Is the universe expanding? • Is a democracy that suspends freedoms a contradiction in terms? • Does Euclidean geometry offer the best "map" for the space we live in? • Are imaginary numbers useful? • Is Catcher in the Rye a comedy or a tragedy? • What is the "third" world? Is there a "fourth"? • When is mission accomplished and victory assured? And as we noted, the notion of intent works the other way around. A teacher may pose an intriguing and seemingly open question yet expect a pat answer. In the worst cases, instructors display intellectual dishonesty when they ask for students' opinions on controversial issues but actually seek or highlight responses that they deem politically or morally correct. This relevance of purpose or intent is more easily grasped if you think about your own response to thought-provoking questions. The best essential questions are really alive. People ask, discuss, and debate them outside school. They arise naturally in discussion, and they open up thinking and possibilities—for novices and experts alike. They signal that inquisitiveness and open-mindedness are fundamental habits of mind and characteristic of lifelong learners. In a more practical sense, a question is alive in a subject if we really engage with it, if it seems genuine and relevant to us, and if it helps us gain a more systematic and deep understanding of what we are learning. Questions such as "What margins of error are tolerable?" are essential in yet another sense. They offer relevance and transferability across disciplines, linking not only to units and courses in measurement, statistics, and engineering, but also to areas as diverse as pottery, music, and parachute packing. Such questions encourage and even demand transfer beyond the particular topic in which we first encounter them. They can (and thus should) recur over the years to promote conceptual connections and curriculum coherence within (and sometimes) across topics and disciplines. Essential questions (and companion understandings) differ in scope. For example, "What lessons can we learn from World War II?" and "How do the best mystery writers hook and hold their readers?" are typically asked to help students come to particular understandings around those specific topics and skills. Such questions are not usually meant to be perpetually open or unanswerable. They refer specifically to the topic of a unit, in these cases, World War II and the genre of writing called mysteries, respectively. Other essential questions are broad and overarching, taking us beyond any particular topic or skill, toward more general, transferable understandings. For example, "What lessons can we and can't we learn from the past?" extends well beyond World War II and can fruitfully be asked again and again over many years in several subject areas. Similarly, we need not inquire solely about how mysteries engage us. That topical question fits under the broader question that applies to all writers and artists: "How do the best writers and artists capture and hold our attention?" • Whose "story" (perspective) is this? • How did Native Alaskans view the "settlement" of their land? • How are structure and function related? • How does the structure of various insects help them to survive? • In what ways does art reflect, as well as shape, culture? • What do ceremonial masks reveal about the Inca culture? • How do authors use story elements to establish mood? • How does John Updike use setting to establish a mood? • What makes a system? • How do our various body systems interact? • What are common factors in the rise and fall of powerful nations? • Why did the Soviet Union collapse? As you can see, the essential questions on the right focus on particular topics, whereas the companion questions to the left are broader in nature. (Although seemingly convergent, these topical questions still give rise to different plausible responses.) Notice that the overarching EQs make no mention of the specific content of the unit. They transcend particular subject matter to point toward broader, transferable understandings that cut across unit (and even course) topics. Overarching essential questions (and understandings) are valuable for framing entire courses and programs of study (such as a K–12 health curriculum). They provide the conceptual armature for an understanding-based curriculum that spirals around the same EQs across the grades. • What do I know and what do I need to know? • Where should I start? When should I change course? How will I know when I am done? • What's working? What's not? What adjustments should I make? • Is there a more efficient way to do this? Is there a more effective way to do this? How should I balance efficiency and effectiveness? • How will I know when I am done? • What should I do when I get stuck? • How can I overcome my fear of making mistakes? • What have I learned? What insights have I gained? • How can I improve my performance? General questions of this type are truly essential to effective learning and performance, within and outside school. Such questions have proven particularly fruitful in subjects that focus on skill development and performance. Their use characterizes a thoughtful and reflective individual, and they can be posed and considered across the grades, as well as at home and throughout life. Various types of questions are used in schools, and most are not essential in our sense of the term (even if they all play useful roles in teaching). Let's look at three other types of common classroom questions: questions that lead, guide, and hook. In later chapters we will describe other types, including probing questions and questions used to check for understanding. • What is seven times six? • What did we say was true of all four-sided shapes? • Who was the president at the start of the Great Depression? • What is the chemical symbol for mercury? • What's the relative minor key of A major? • Which letters are vowels? Leading questions allow a teacher to check that learners can recollect or locate specific information. Thus they have their place when recall and reinforcement of factual knowledge are desired. Another term for such questions is rhetorical, which usefully reminds us that they aren't real questions in an important sense. Their purpose is not to signal inquiry but to point to a fact. That's why lawyers and debaters routinely use rhetorical questions to direct attention to their point. • Is this sentence punctuated properly? • Why must the answer be less than zero? • How do we use the "rule of thirds" in photography? • Can you state Newton's 2nd Law in your own words? • When did the main character begin to suspect his former friend? • Which words tend to be feminine and which masculine in French? Questions that guide are broader than questions that lead, but are not truly open-ended or designed to cause in-depth inquiry. Each of these questions is steering the student toward previously targeted knowledge and skill—to arrive at a definite answer. Yet the answer requires some inference, not simply recall. As such they are important tools for helping teachers achieve specific content outcomes. Although such questions are familiar and useful, we do not consider them essential, as you will see if you check them against the seven criteria noted earlier. They may be fruitfully employed during one or more lessons, but they are not intended to set up a long-term inquiry and will not be revisited over an extended time period. To open a unit on nutrition for 6th graders, a teacher poses the following question: "Can what you eat and drink help prevent zits?" This hook effectively captures students' interest and launches an exploration of the unit's broader EQ: "What should we eat?" A science teacher in an Alaskan village uses this question to hook his students: "Are we drinking the same water as our ancestors?" Given the cultural reverence for ancestors and the significance of the ocean for survival, this is an elegant opener in the context of his school community. It is coupled with the companion essential question "Where does water come from and where does it go?" to spark ongoing inquiry into the relevant science. Figure 1.1 provides examples that will help you to distinguish among the four types of classroom questions discussed in this chapter, and Figure 1.2 highlights the characteristics of each type. Can what you eat help prevent zits? What types of foods are in the food groups? Do you know any teenagers that act crazy? Why do they act that way? When (time period) and where (location) does the novel take place? What makes a story timeless? What "truths" can we learn from fiction? Do your parents like your music? What are the notes of the C major scale? Why would a composer use a major as opposed to a minor scale? What distinguishes music from "noise"? What influences musical tastes (e.g., culture, age)? Do you agree with the "stand your ground" laws? Does the Second Amendment support "stand your ground" laws, according to the courts? Which constitutional principles are timeless and which should be amended if outdated or outmoded (e.g., only white males were once seen as "persons")? Where is the balance between personal freedoms and the common good? Is the Fourth Amendment or any other parts of the Bill of Rights out of date? Why do kids sometimes act stupid when they are in groups? Who was B.F. Skinner? What is behaviorism? What are the similarities and differences among behaviorism, Gestalt psychology, and Freudian psychology? • Often framed in engaging "kid language"
Classroom questions can be classified into different types, each with different, legitimate purposes. As you consider the appropriate types of questions to include in your teaching, we caution you, however, to distinguish between two connotations of the term essential: (1) essential to me in my role as a teacher, where questions that "hook" and "guide" are regularly employed, versus (2) essential for students to continuously examine so as to "come to an understanding" of key ideas and processes. We are using the second meaning in this book. Indeed, in an understanding-focused curriculum, we want more of the latter kinds of questions. My principal says that we should have at least one essential question for every lesson we teach. I am finding this very hard. Can you help? In Understanding by Design, we have chosen the unit as a focus for design because the key elements of UbD—transfer goals, understandings, essential questions, and performances of understanding—are too complex and multifaceted to be satisfactorily addressed within a single lesson. In particular, essential questions are meant to focus on long-term learning and thus be revisited over time, not answered by the end of a class period. Not only would it be difficult to come up with a new EQ for every lesson; the predictable result would be a set of superficial (leading) or, at best, guiding questions. Your principal is presumably well intended, but we would want her to distinguish between using EQs on a regular basis (we endorse that) and using a new one for each lesson. One or two truly essential questions can be used to frame the learning over the course of many lessons. Perhaps you should give your principal this book! This is a factual question with a single correct answer. This is a rich question for exploring the many facets of effective writing, including different genres, audience/purpose connections, writer's voice, and organizational structures. This is intended to be a thought-provoking, open question with many nuances (so don't be fooled by the phrasing). Although the format of the question may wake up a sleepy student, it doesn't really open up worthy inquiry. At best, it can lead to a definition of a new term. This is a useful question for helping students understand the concept of adaptation in various manifestations; however, there are specific answers that could be found in a book. This is an open question, widely applicable across mathematical topics across the grades; the question helps students come to understand an abstract yet important idea: mathematics involves tools and methods that have both strengths and limitations. I'm confused about the difference between guiding and essential questions. Some of the questions you cited as essential—such as "What do the best writers do to hook and hold their readers' attention? "—seem to fit the definition of "guiding" questions: "Not open-ended or designed to cause in-depth inquiry. They are designed to focus learning of content or activities." You're correct; the difference is a bit subtle. But it all goes back to intent, as we said in this chapter. If the aim is to arrive at a single, final, and not-to-be-questioned answer, then the point of the question is to guide learning toward that answer. But if the point is to keep questioning, even if we arrive at a provisional answer that makes sense, then the question is essential.